Property inequality in Korea is very serious that top 5% possess almost half and top 1% own 25% of the total. Aggregated property tax is supposed to be levied to expensive properties in order to restrain unearned income but does not function at the moment. Hence, PSPD has presented a report on 5 March regarding prejudice on aggregated property tax stressing that it is not a tax bomb because taxable persons are limited and tax rate is very low. It also suggested to increase the tax rate to the level set when firstly adopted since current rate has dropped to half in the letter of opinion on tax revision submitted to the Ministry of Strategy and Finance and through a forum <Measures to enhance aggregated property tax to improve wealth inequality> which was held at the National Assembly. Another concern is necessity to decrease blanket deduction of inheritance tax from 500 million won to 300 million won and to reduce deduction limit for inheriting family business which is currently set up to 50 billion won. Furthermore, recommendations on practical measures were made regarding levying taxes on income from financial assets, earnings from religious occupations and rental income. 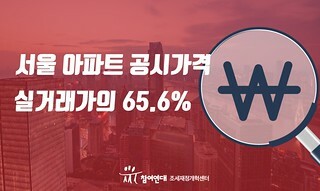 On 13 March, PSPD released an issue report <Declared values of apartments do not reflect real trading values> and showed that only 65.6% of real trading values are reflected in declared value of apartments in Seoul. For example, reflection rate of average real trading value of Gangnam and Seocho-gu recorded the lowest in Seoul despite that property prices are the highest in those two districts. If real values are applied, current property possession tax reach to only 34.8%. These problems create reduction of aggregated property tax and omission of taxable persons. PSPD will keep trying to inform people that current declared value and aggregated property tax distort justice in taxation and demand to make them normal. There are so many pending agenda at the National Assembly and establishing an investigation agency for high-ranking public officials is one of them. At the end of last year, leading and opposition party agreed to form a special committee for judiciary reform in the National Assembly but the committee hasn’t done any works for three months up today. Joint Action for establishing investigation agency for high-ranking officials in which PSPD participates keeps carrying out both online and offline signature campaign and writing columns in series for the purpose of pressurizing lawmakers. As clearly shown in the cases such as external influence pressed on Kangwon land investigation and prosecutor Jin who offended sexual assault but resigned without punishment in 2015, it is urgent to set up a special investigation bureau. 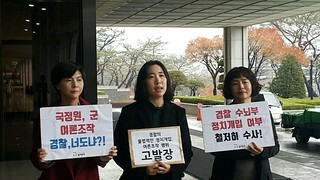 Hence, PSPD plans to deliver collected signatures to Jeong Seong-ho, a chairman of Special Committee for Judiciary Reform on 27 March and demand its establishment once more. Finally, Lee Myung-bak, a former president is detained for investigation. ‘He gets exactly what he deserves’! PSPD requests to strictly punish him who has been consistently lying. Not only accepting bribes but also there are several tens of allegations against Lee that he should receive adequate punishment. Looking back, Lee and PSPD have confronted in many occasions. Secretariat office was seized and searched for the first time since its establishment because of holding huge candle rallies, one of the activities of Countermeasure Council for mad-cow disease during his administration. Activists were taken to the police and even arrested. PSPD has suffered for more than 10 years and still now because Lee administration even sued and asked for damage compensation incurred during candle rallies. Furthermore, it has been persistently attacked for raising problems with warship Cheonan sinking and Jeju Naval base construction. Of course, PSPD also has been fighting back. It reported hi for illegal conducts committed in the process of personally purchasing land in Naegok-dong in 2013 and three more times for the charge of making DAS slush fund and secret military deal with UAE. Still, there are many cases PSPD keeps its eye on including mobilizing National Intelligence Service and the Police to manipulate public opinions, accepting bribes from Chabeol and providing a special favor in return, squandering national finance in the name of resource diplomacy and grand four-river project. Monitoring Lee will continue on investigative detention as well as trials take place later on. Discussion on constitutional revision initiated by the Blue House has been heated up. While Special Committee for Constitutional Revision and Political Reform is doing nothing, Special Advisory Committee for People’s Constitution is formed to build president’s reform bill and a few PSPD officials are participating. PSPD has been internally preparing for the revision for more than one and a half year and solely appealed for an enactment on 27 February. In the on-going current discussions, right to live in peace and democratic control on defense and diplomatic policies are being missed out that PSPD has made separate bill to appeal in cooperation with other peace organizations. Starting from 20 March, each organizations are presenting own comments in respect to a revision suggested by the Blue House approving basic direction which enhance basic rights, people’s sovereignty and decentralizing self-governments but arguing that reducing presidential authorities are not sufficient. As the president proposed constitutional revision bill on 26 March, discussions are actively taken place. Most of all, National Assembly and political parties should not use it for political warfare but try to come up with a bill made and agreed by National Assembly. Concerning this, PSPD has submitted a letter of opinion on major contents and is preparing to hold a big press conference in order to give pressure on National Assembly to discuss. Demarcation of constituency for regional election was resulted in illicit liaison of large political parties. Liberty Party Korea and the Minju Party have been dominating powers in cities, provinces and counties and they agreed on demarcation favorable to keep their powers in municipal councils. Regional demarcation council of each regions insist to adopt constituency which elect three to four members in order to give a chance to rookies and small parties to enter the National Assembly. However, two giant parties persisted with two seats which is advantage to them. Following Daejeon, Gyeonggi, Busan, Incheon and Daegu, even Seoul passed constituency demarcation breaking it into smaller from four to two seats. Therefore, PSPD has announced statements of severe protest one after another demanding three to four seats constituency but came to naught. 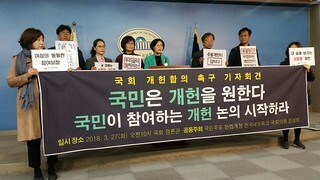 At the Seoul City Council, PSPD held a press conference, attended, warned and protested to council members in which Minju party has absolute majority. Nevertheless, the council even ignored seven new proposals of four seats constituency submitted by a constituency demarcation committee and divided it into two seats. 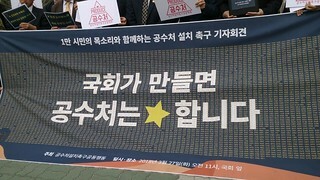 We, voters are the one who can change Korean politics which is intoxicated with powers and puts party’s interest on top priority. Regional election has a great influence on our daily life but does not receive enough attention from citizens so that PSPD is preparing a meeting to study and discuss how to get involved in. The police was not an exception. It is revealed that the Police of Lee Myung-bak administration fabricated public opinions and investigated people who wrote denouncing comments online. Mobilizing conservative organizations, it tried to manipulate online public opinions which criticized the government and defined opponents as pro-North Korea, and attempted to punish them legally. Furthermore, it received information on comments made against the government and the defense ministry, and their writers from the military cyber command. On 15 March, PSPD has reported Cho Hyun-o, a former police chief and Kim Yong-pan, a former security director who were responsible for the charge of misfeasance. However, the prosecutors recently informed PSPD that the case has transferred to the police. Can anyone trust the Police who investigate the police? Without rooting out political and illegal conducts committed by the police, the police would get too strong to control. Therefore, PSPD clearly stated its stance that the prosecutors must investigate the case thoroughly. Otherwise, it is required to swiftly establish an investigation agency for high-ranking public officials and let it do the job. PSPD is raising its voice to investigate dominance and corruptions of Hana Financial Holdings since there are allegations on economy-politics cronyism of former and current chairman of Hana. They are involved in Lone Star which made money in Korea and took off, Hana Academy corruptions, supporting Jeong U-ra and violation of Kim Young-ran Act. Especially, Kim Jeong-tae a chairman of Hana Financial Holdings has been reported for several charges that he unfairly involved in promotion of Lee Sang-hwa a former president of Hana Germany who is known to be a safe keeper for Choi Soon-sil. 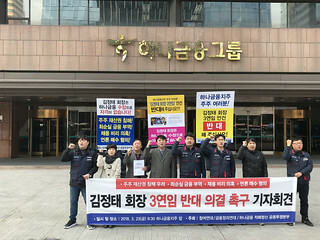 PSPD has been entrusted by small shareholders and attended in the general meeting of shareholders on 23 March in order to express disapproval on the third executive term for Kim Jeong-tae. Furthermore, it urged National Pension Fund to exercise the vote of disapproval. On the other hand, PSPD has not only reported Lee Myung-bak a former president but also provided evidences and information proving that MB is a real owner of DAS. In addition to collecting materials and writing them in reports, PSPD obtained and exposed a contract showing that a profitable affiliate of Hyundai Motors was about to handed over to DAS. Suffering from wars, massacre, famine and exodus for more than seven years, the boundary between life and death has disappeared in Syria. More than a thousand residents were isolated in death within one month when Syrian government troops closed the rebel’s last supply line into Aleppo in 2016 and that crisis is being repeated in Eastern Ghouta, a rebel-held territory since last February. The international society feels very sorry but helpless in resolving the situation. We do not know the best way to settle it down but all would agree that this tragic must end as soon as possible. 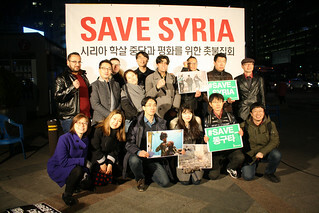 In cooperation with Nanummunhwa, Amnesty Korea, Help Syria, PSPD lighted up candles on 22 March at Gwanghwamun square urging to halt civilian massacre and end the war in Syria. We hope more people pray together for the peace in Syria.